Jam was an amazing racer, racing most of his 139 races at Southland in Arkansas which is one of the top tracks in the country with the toughest competition. He raced at the top AA level there and competed in Stakes races so he was one of the top racers in the country. 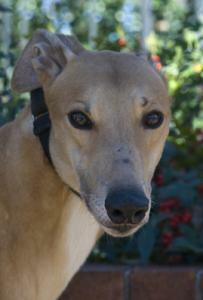 He was recently moved to Palm Beach to race and was retired from there because of a dislocated toe. Our vet is checking the toe. Jam will turn 5 on April 8th. His sire is the very famous Kiowa Sweet Trey and his dam is Slatex Eva. He raced at 77lbs and is a very sweet, friendly boy. Jam will talk to you with a very cute soft ARR ROO ROO when you go up to his crate. He passed his cat and small dogs tests. More as we get to know him.